I hope everyone had wonderful Passover & Easter holidays. We sure did - nice weather, lots of goodies and the Easter outfits looked great. The DIY silly putty & squashy eggs went over a treat with my niece & nephew, so all that holiday crafting was well worth it. I definitely need to recharge though - all the spring cleaning, homeschooling, family stuff & projects have worn me out! On the plus side there are quite a few finished things that I finally got around to photographing, so I've still got a lot of fun stuff to share:) I'm also thinking about hosting a weekly crafty link party. What do you think? I'd love to see what all my crafty friends are up to, discover new crafty blogs & feature some great ideas from others. There are hundreds of craft posts in my Google reader every day & I try to keep up, but I'm only one woman! Leave me a comment if you'd be interested and if enough people are I can get the details together. Ok, so let's get down to what you come here for - the craft!! I thought this would be a great gift for the grandmas (who both had birthdays recently). It would also be ideal for Mother's Day. The idea of framing fabric handprints came from Becca at Naptime Journal. She made a really cute shadowbox with her daughter's handprints. 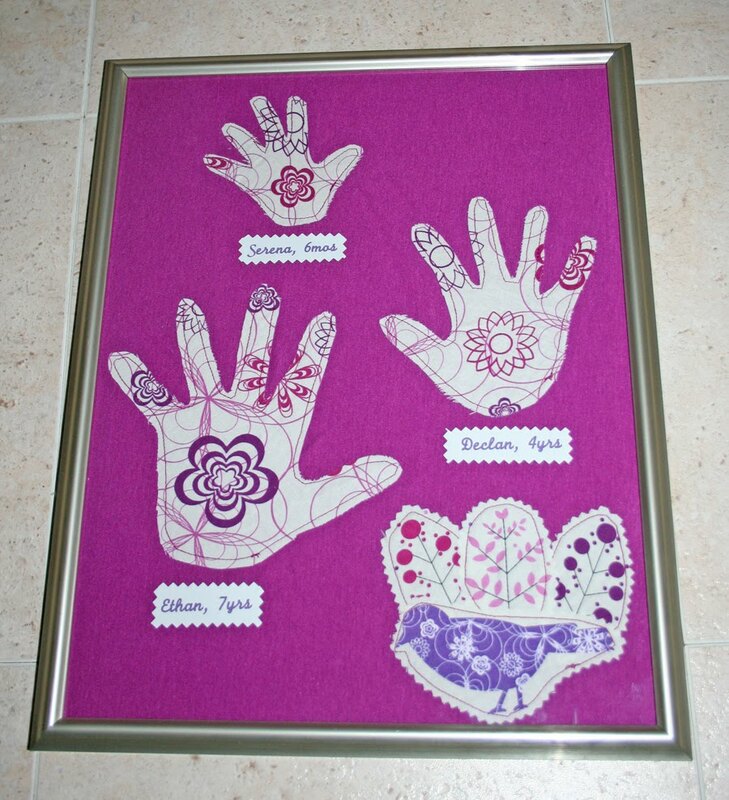 I wanted to do one that had all my kids in it, so I got some frames & using fabric from my stash, I traced each of my kids hands on some cute print fabric. I cut out some bird & tree shapes from some coordinating fabric and stitched them all to a solid knit background. I also added the names and ages of each of my kids, since it's so easy to forget those details as time goes on. Needless to say, they were a hit and were pretty easy to put together since I only had to buy the frames. Now I just need to make one for me! Have a great day and thanks for linking back! 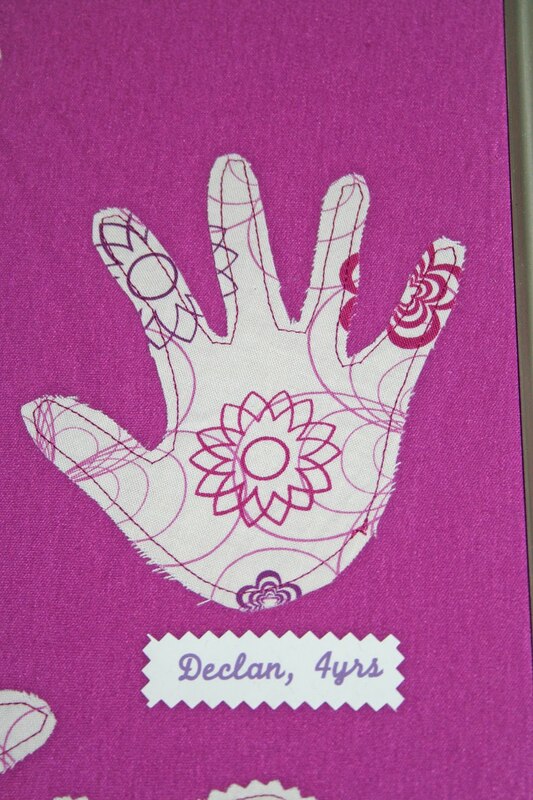 A cute way to keep and compare the little hands! So cute! I don't think I have the sewing skills to sew around Avery's hand, at 5 weeks old it is sooo little! Adorable! I might have to try this! What a great & beautiful idea! Love it. Thanks for sharing. Great idea! I've done something similar, but I just used plain 'ol construction paper. This looks MUCH nicer. That is so sweet!! You will love it for years to come!! Thanks for linking up today!!! Love this idea....might have to make it for the grandparents too! I am absolutely going to make this for my mom & MIL for Mother's Day. Great idea! Found you through Somewhat Simple. I LOVE this!!! I could spend all day browsing your blog!! LOL! Visiting you from the Friday Follow! Hope you'll come visit me too! This so super cute, you definitely have to make one for yourself! Hi Cheryl--so glad you found me on New Friends Friday so I could find you! Love your blog and all you do. Looking forward to more! That looks wonderful. What a lovely keepsake!!! Love this! Hopped over from Friday Follow and I am so glad I did. I am now your newest follower. Have a great weekend. Adorable! Thank you for bringing your hodgepodge to my party! Hope to see you again. P.S. I'll see you at YOUR party! What a great keepsake. I love this idea. Thanks for sharing at 'Look at me, I'm SO Crafty!' at Fun to Craft! !